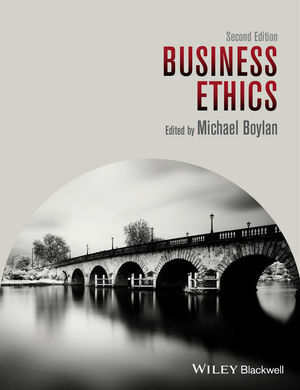 The second edition of Business Ethics introduces readers to key ethical issues that arise within the world of business, providing a strong theoretical foundation as well as real world applications. This new edition has been greatly revised, and includes new sections on the financial services industry, globalization, and global economic justice. Michael Boylan is Professor and Chair of Philosophy at Marymount University. He is the author and editor of 26 books, including his manifesto on social/political philosophy A Just Society (2004), and on cosmopolitanism Morality and Global Justice: Justifications and Applications (2011). Boylan was himself the focus of an edited volume, Morality and Justice: Reading Boylan’s A Just Society (2009). He has served on professional and governmental policy committees and was a fellow at the Center for American Progress and a program presenter at The Brookings Institution. He has been an invited speaker in nine countries around the world, including talks in Oxford, Cambridge, Cologne, Oslo, Dublin, Sydney, and the Sorbonne. Kenneth E. Goodpaster and John B. Matthews Jr.